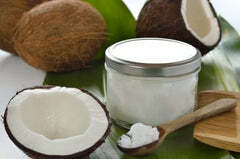 In my last post, I shared with you why coconut oil is one of the MOST powerful foods you can put in your body. It is HIGHLY alkaline, purifies your blood, and helps reduce ACID levels in your body! powerful immune booster to fight bacteria, fungus, and viruses! Now that is a super food! So today, I’m sharing 4 awesome recipes to use coconut oil in different ways. Of course, you can always use it to make a quick salad dressing or in place of every other cooking oil, but I love when that creamy, exotic coconut flavor can be the star of the show. Coconut Oil is SO versatile and can be used in so many different types of cooking from smoothies to salads to soups to my favorite raw desserts such as my chia puddings you can find in the Alkamind Get Off Your Acid 7-Day Fall Cleanse (5 different chia pudding variations!). If you’re going to do any cooking for the holidays to come, the Coconut Pumpkin Curry Soup is a delicious, alkaline soup that your family and friends will absolutely love. The alkaline spices not only add to the flavor, but give this soup a nice kick! The smoothie recipe, Tropical Breakfast in a Cup, is a delicious and energizing way to start your day. It contains lots of protein and good healthy fat to keep you feeling fuller longer, plus it acts like a slow burning coal to give you plenty of energy all day long! The Homemade Coconut Granola feels really decadent and sweet, but it’s a great mix of ingredients that will fulfill your sweets cravings and act as a great alkaline snack at the same time. Make a big batch, and keep a smaller zip-lock bag on you at all times so you ALWAYS have a go-to healthy snack that will keep you energized all day long. The Fall Fresh Pasta Salad is PERFECT for the next few months. It’s a fantastic hearty fall to early winter dish that will never leave you feeling hungry. Add some garbanzo beans to give you some extra protein. Stir in the onions and garlic (cook about 5 minutes). Next, mix in the vegetable broth, curry powder, sea salt, ground coriander, and red pepper flakes. Cook and stir until the mixture comes to a gentle boil, about 10 minutes. Cover, and boil 15 to 20 minutes more, stirring occasionally. 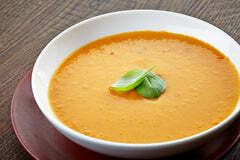 Then add in the pumpkin puree and coconut milk, and cook another 5 minutes. Pour the soup into a blender, filling only half way and working in batches if necessary; blend until you receive a nice smooth texture. Optional: reheat briefly over medium heat before serving. Make sure coconut oil is melted. If your home is above 76 degrees F, the oil will be in the liquid state. Once the temperature goes below 76 degrees, it will turn solid. If this happens, melt the coconut oil on the stove for a few seconds. 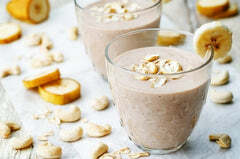 Put frozen bananas, rolled oats, almond or coconut milk, raw almond butter, carrot, vanilla, raw nuts, and the melted coconut oil in a blender. Blend until smooth. Top with cinnamon and/or sliced almonds (or cashew pieces). Serve immediately or store in fridge for up to 24 hours. Preheat the oven to 350 F. Combine all the dry ingredients in a mixing bowl. Add in the liquid coconut nectar and melted coconut oil. Combine until the dry ingredients are sticky. Spread the granola on an even layer of a large rimmed baking sheet. 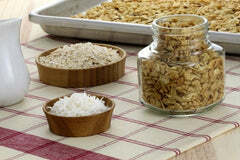 Allow to bake in the oven for 20 to 30 minutes, stirring the granola approximately every 10 minutes. OR place in a Dehydrator and dehydrate at 115 degrees for 24 hours. Heat oven to 400º. Toss the squash in coconut oil, salt and pepper. Roast for 20 minutes until fork tender. While noodles and squash cook, heat 2 tablespoons of coconut oil, in a sauté pan and cook leeks until melted, about 8 minutes. Add garlic and cook for another 7-8 minutes. Combine the noodles, squash, and leek mixture in a bowl. Add sage, salt and pepper and toss with remaining olive oil. For added protein you can add a can of organic garbanzo beans. 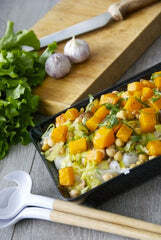 101 NEW Fall Alkaline Recipes, easy to follow, taste SO good you’ll feel like you’re cheating! 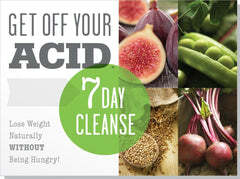 the guidebook with everything you need to know about cleansing to help you…GET OFF YOUR ACID! AlkaMind Daily Greens and Daily Minerals Included! Free Alkaline/Acid Food Guide with 550 foods!